What is Prevention and Restorative Yoga? Yoga Bloom 100-Hr Prevention & Restorative Yoga is the first Specialty Certification of its kind. This is a 100 Hour Yoga Certification Program, with a comprehensive curriculum of Restorative Yoga and Prevention Yoga techniques. There are over 50 hours of Restorative Yoga and additional 50 hours of Prevention Yoga to complete Yoga Bloom 100-Hr Prevention & Restorative Yoga. This in-depth specialty program breaks down Restorative Yoga theory, practice and implementation. Modules focus on mentorship and personal development as a teacher and practitioner; this also requires students to be held accountable for their participation. Trainees will be required to demonstrate understanding of lesson planning for specific issues and themes. Demonstrations on students will help trainees’ understanding and ability to apply skills in a constructive manner. We will work with key elements: Technique, Sequence, Timing, Benefits and Contraindications. Prerequisites are required for acceptance into program – Application available here. 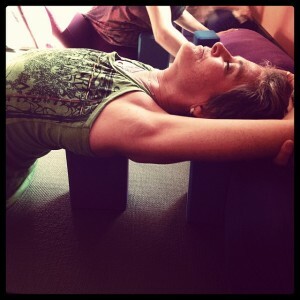 I have introduced Foundation of Restorative Yoga – Level I in San Francisco, Nashville, Asheville and New York. Brain on Yoga is taught in San Francisco and New York. Please contact me if you are interested in hosting trainings at your studio. All sessions will be held in Cora’s private yoga studios in San Francisco, CA and East Hampton, NY. Classroom is limited to 6 attendees to promote a positive collaborative learning experience in an intimate, safe environment for contribution and inclusion. Yoga Bloom Foundations is mandatory entry level for all participants. Each session focuses on therapeutic applications, and ways to address chronic and acute ailments including lower back pain, sciatica, fibromyalgia, joint reconstruction and ways to support and assist students. Learn to observe body misalignment, and ways to assist rehabilitation and pain management. You will receive a Certificate after completion of all course work required for each session. ALL sessions apply to Yoga Bloom 200RYT, 300RYT and YBLAB 1000CYT Programs. Each session requires attendance of all hours, written assignments, practicum and mentoring hours to complete coursework. These programs are registered with Yoga Alliance 200RYS & 300RY. Level III – Womens Health: Menstruation through Menopause (includes Pre-Natal and Breast Cancer); Mens Health: Prostate and Testicular Cancer. Level IV – Restorative Yoga for Emotional Stability – Grief, Anxiety & Depression. Trainees will be required to demonstrate understanding of lesson planning for specific issues and themes. Demonstrations on students will help trainees’ understanding and ability to apply yoga therapy skills in a constructive manner. CEU hours towards Yoga Bloom 200-Hour, 300-Hour and 1000-Hour Preventative & Restorative Yoga Training Program with completed assignments and practicum.